More people than ever are turning to cosmetic dentistry procedures like teeth whitening to get a bright, beautiful smile. 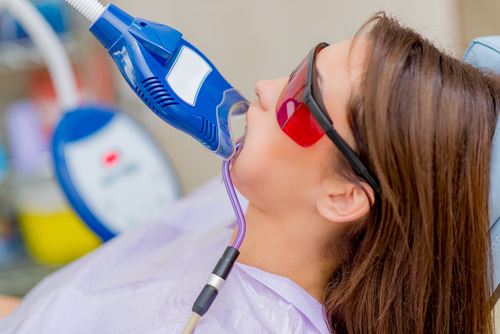 Because there are so many over-the-counter products available, however, patients typically have a lot of questions when it comes to professional teeth whitening from their dentist. Below you’ll find answers to some of the most commonly asked questions. Is the Procedure Covered by Dental Insurance? Like most cosmetic dentistry procedures, teeth whitening is not typically covered by dental insurance. Talk with your dentist about payment plans or financing options to make the procedure more affordable. I n-office procedures brighten your smile by several shades in less than an hour. Take-home kits provided by your dentist are used daily for as little as 15 minutes per day or as long as overnight and can take up to two weeks or more to produce your desired results. Will It Damage My Tooth Enamel, Fillings, Crowns, or Veneers? Professional whitening gels do not cause any damage to the tooth enamel or to any restorations you have. If you have tooth-colored restorations, like white fillings or ceramic crowns, however, those typically do not respond to bleaching and may need replacement if they have become discolored. Does It Cause Permanent Tooth Sensitivity? You may feel some sensitivity during the teeth whitening process and for a day or two after, but the procedure does not cause permanent sensitivity. Within a couple of days, your teeth should return to their prior sensitivity level. Teeth whitening results are not permanent. Beverages like coffee, tea, and red wine can re-stain your teeth after treatment. Your dentist may provide you with a take-home kit you can use on a regular basis to maintain your results for an extended period. If you want a whiter smile, professional teeth whitening is one of the safest and most effective ways to achieve this goal. Diane M. Evans, DDS, offers this and several other cosmetic dentistry procedures to help her Rush, NY, patients achieve the dazzlingly beautiful smiles they’ve always desired. Dr. Evans and her staff can answer all your questions about the teeth whitening process and will work with you to develop a treatment plan to meet your individual needs. Visit the practice website to learn more, or call (585) 321-1460 to schedule an appointment.